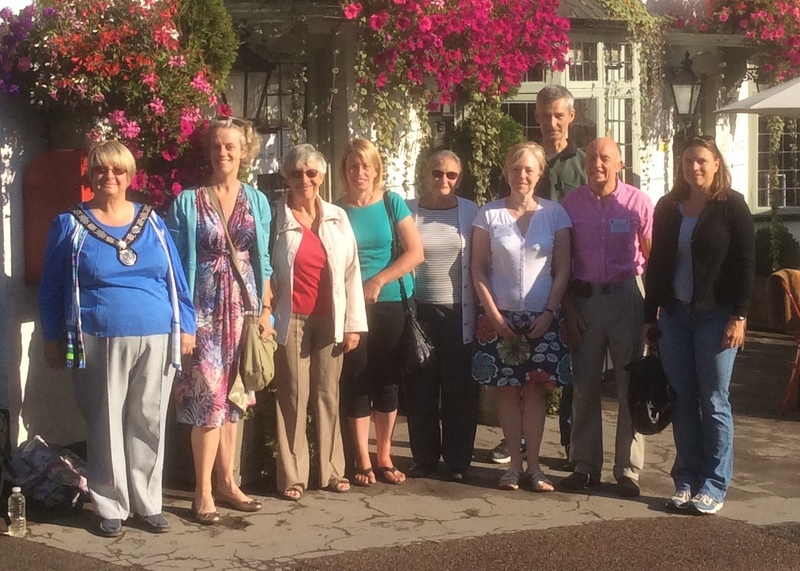 We are a group of people who meet to broaden the friendship between Harpenden and Alzey in Germany, Harpenden's twin town. German Conversation Evening. The next evening is on Monday 15th April from 7:30pm to 9:30pm. German speakers of all levels are very welcome. See the Calendar for further information. Publicity in the Harpenden Senior Forum's newsletter. An article about our 40th Anniversary celebration has appeared in the March 2019 issue of newsletter. You can view it online or download a copy from here. Thanks to the Senior Forum for including our special event. 40th Anniversary Tea Party celebration will soon be upon us. See Forthcoming Events and the promotional flyer for details. Do take a look at our Facebook page. If you would like more information, please send an Email to info@friendsofalzey.com. We are always happy to hear from people interested in our organisation! We hold a number of social and fundraising events throughout the year. Following are entries of events - future and past. The 40th Anniversary of the ‘Friends of Alzey’ Tea Party celebration. See below for details and a promotional flyer. Check your diary and join us, we look forward to seeing you! Having been founded in 1979 the 'Friends of Alzey' will celebrate our 40th anniversary on Saturday 27th April 2019 in Park Hall. We will hold a special Tea Party in the afternoon in place of our Annual Dinner to mark this milestone in our history. We would like our birthday party to be a very special occasion. Together we will not only celebrate 40 years of active and joyful commitment to the Alzey/Harpenden twinning, but also have a chance to look back on previous visits and other memorable occasions. With this in mind, we are advertising the event around the town to attract former members of our group, or individuals who have hosted guests from Alzey, or visited Alzey in one capacity or another to join in the celebration. Admission to the party is by ticket only which are very reasonably priced at £7.50 per person for tea/coffee, a selection of sandwiches, scones with cream and jam, birthday cake plus a glass of Sekt! Click here to see our flyer and how to get your tickets. Alternatively send us an email to info@friendsofalzey.com. Written for the 30th anniversary, a short report about the history of the 'Friends of Alzey' from one of the founder members of the Friends is available to view. Click here: Reminiscences on the Origins of the Friends of Alzey. Our AGM took place on February 21st at the Skew Bridge and was very well attended. The committee members and officers were re-elected and the Treasurer and Chair presented reports on last year’s activities. After the business of the meeting an excellent meal was enjoyed together and those members who will travel to Alzey in September were able to share their anticipation of the wonderful weekend to be spent at the wine festival. See links for the Friends of Alzey Chair report for 2018 and the photo page of new members enjoying the evening. "Well organised" and "great fun" – feedback from some of the fifty or so participants in our quiz night at Park Hall in October endorse the committee's verdict that the event was a once again a great success. The question rounds and 'marathon puzzle' were expertly put together by Ginny and her team, with the 'Which castle is shown in this photo?' round drawing the evening's most intense buzz of discussion (and stimulating some castle tourism to boot?). The fish and chip supper from Harpenden Fish & Chips was well received and allowed a welcome interlude for conversation with friends old and new. Thanks to the generosity of our members and their guests the evening raised a substantial sum towards the hosting of our Alzey visitors in 2020. Ginny's team and Park Hall have already been booked for October 19th 2019 – see you there! Friends of Alzey members were invited to join a tour organised by Bim Afolami MP on 18th October. The walking tour lasted a little over 2 hours. It was well organised and interesting, even for members who had visited Parliament before. Thanks were given for the invitation. 60 people braved falling snow to attend our Annual Dinner at Park Hall on Saturday March 17th. Good food and good company were enjoyed by our long-standing members, new members and their friends alike. This year we welcomed four A level students who study German at Sir John Lawes School and their teacher, Mrs Susanna Leaver. Their attendance was made possible by the generosity of last year's guest speaker, Mrs Anne von Fallois. Bim Afolami MP spoke after the dinner about the influence on him of German philosophy and politics. He was thanked in both German and English by the Head Boy and Deputy Head Boy, who earlier had had the opportunity to speak to and question Mr Afolami. Wine from the Alzey town winery was presented to our guest speaker as a mark of our thanks. The committee all worked hard to make the evening such a success that the guests seemed reluctant to go home, chatting animatedly amongst themselves at the end of the proceedings. Thanks go also to Yvonne Bamford for her catering and to Steve Jones of Nang Noi Thai Restaurant in Vaughan Road, and to other friends of our organisation, who kindly donated a raffle prize. Congratulations to the students of German – in the week after our Dinner they were declared winners of the Goethe Institut's debating competition. This is a wonderful achievement; their prize is a trip to Germany. We hope they enjoy their time over there and say hello to Alzey if they happen to pass through!